WICHITA, Kan. - January 7, 2015 – Beginning with the 2015/2016 school year, K-12 districts throughout America, in addition to students who benefit from the lunches they provide, will have new protein choices due to pioneering efforts by the Shady Brook Farms® turkey brand. Employing a U.S. Department of Agriculture (USDA) Process Verified Program for large-volume turkey production, the Shady Brook Farms brand will offer high-quality, nutritious, wholesome, flavorful and affordable protein products to nourish school children. These turkey products will not carry a premium price tag, enabling school districts and the USDA to better leverage their budgets and provide high-quality protein that meets students’ nutritional needs. Importantly, Cargill will provide USDA Process Verified turkey for bulk commodity processing specifically for National School Lunch Program purchase. No antibiotics used for growth promotion - antibiotics only used for treatment and prevention of illness. 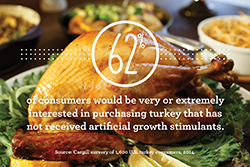 Cargill’s two major turkey brands, including Shady Brook Farms, are the first to offer turkeys raised without antibiotics used for growth promotion, which is aligned with U.S. Food and Drug Administration (FDA) Guidance For Industry (GFI) #209 and #213, seeking a voluntary reduction. The USDA Process Verified Program requires third party audits of farm practices, including animal handling by trained personnel, and detailed documentation for ongoing federal compliance. 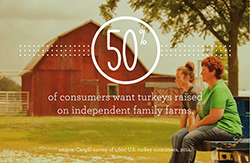 Cargill’s 2014 nationwide consumer research revealed that, in addition to a desire for reduced growth stimulants in their turkey, consumers also expressed a strong preference for birds raised by independent farm families. During 2013 and early 2014, Cargill reformulated popular turkey items to reduce the sodium content for school year 2015/2016 as part of the company’s overall effort to provide schools with turkey that helps meet nutritional regulations. The company’s Shady Brook Farms school products will replace its Harvest Provisions® brand in the 2015/2016 school year, the latter having been previously marketed for school lunch programs. Cargill is one of the leading turkey producers in the U.S. and has been providing turkey protein products to USDA’s National School Lunch Program since 2011.